Quoting Rabin and calling for a two-state solution, PA leader finally drops 'bombshell' announcement. 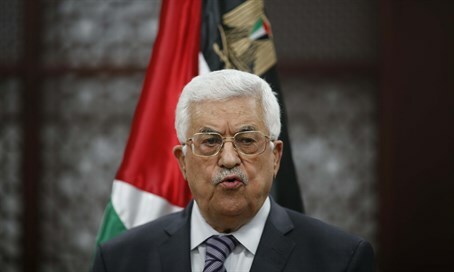 Palestinian Authority (PA) leader Mahmoud Abbas has announced that the PA is no longer committed to the 1994 Oslo Accords. In his UN General Assembly address Wednesday evening, Abbas wasted no time attacking Israel from the podium in New York. He began by repeating calls for a "two-state solution," and condemning Israeli "settlements" in Judea and Samaria, as well as the blockade of Gaza. Israel "continues its blockades of the Gaza Strip, thus deepening the immense suffering of our people there. This is done in defiance of UN resolutions and agreements signed between the two sides...under international auspices," he said, despite the fact that Israel's blockade of the Hamas-ruled enclave was ruled as legal by the UN's Palmer Report. He quoted a 1976 interview by former Israeli Prime Minister Yitzhak Rabin - in which Rabin branded Jewish communities in Judea and Samaria as "a cancer" - and called on the international community to pressure Israel to dismantle them. "Do the votes by democratic countries against Palestinian resolutions...promote peace...or rather encourage extremists, promoting their hatred and racism and making them think they are above the law, to the point where they commit the burning of a whole Palestinian family in the town of Duma in the West Bank?" he added, referring to the deadly firebombing of a Palestinian home in July. "We do not respond to Israeli brutality and hatred with the same, instead we are working for peace," he adding, ignoring his own PA's ongoing incitement playing a key role in stoking Muslim violence in Jerusalem, aside from direct terror attacks committed by his Fatah faction. The Palestinian Authority would continue to function, he said, putting to rest rumors that he would dismantle it altogether. "We are determined to preserve the unity of our land and people...we will not accept temporary solutions or a fragmented state," he said. "We will not allow this...we rather will seek to form a national unity government that functions according to the program of the Palestine Liberation Organization (PLO) and hold presidential elections." Abbas went on to describe "Palestine" as "the country of holiness and peace. It is the birthplace of Christ, the messenger of love and peace...and the night journey of Mohammed, peace be upon him, who was sent as a messenger to the world." Conspicuously, no mention was made to any Jewish history in the holy land. "Those who would like to seek and promote peace and to fight terrorism should start by resolving the question of Palestine - that is the beginning or the end of everything," he continued, thanking European states who recently voted to recognize the Palestinian Authority as a "state," as well as those who supported its efforts to raise the PA flag at the UN headquarters. "The day, God-willing, is not far when we will raise the flag of Palestine in east Jerusalem, the capital of Palestine," he declared. Accusing Israel of breaching the 1994 Oslo Accord, he said the Jewish state had effectively "destroyed" the agreements, effectively "negating" them and freeing the PA of its own commitment. He even compared Israel's presence in Judea and Samaria to the Nazi occupation of Europe during the holocaust. "Thus, and given all of that, here we declare that as long as Israel refuses to commit to the agreements signed with us, and as long as Israel refuses to cease settlement activities and refuses to release the Palestinian prisoners...Israel has left us with no choice but to insist that we will not remain the only ones committed to those agreements." "We therefore declare that we can not be part of this agreement and Israel must undertake all its responsibilities of an occupying power...We for our part are not committed to those agreements, and Israel must bear full responsibility," he said, referencing the Oslo Accords that created the PA and removed the PLO and Fatah from international terrorist lists. Additionally, he vowed to continue to pursue Israel through the International Criminal Court and via other unilateral initiatives in the UN, as the PA has been doing for the past several years already - moves which are themselves in breach of the Oslo Accords, which stipulate that neither side should take unilateral steps. "Despite all that my hands remain outstretched for the just peace that will ensure my people's rights and dignity," he concluded.